Peter Crouch's goal 10 minutes from time handed Tottenham Hotspur a 1-0 win over below-par AC Milan in their Champions League last-16 first leg on Tuesday. Spurs were the better side in the first half and Milan in the second, and England striker Crouch netted slightly against the run of play following winger Aaron Lennon's swift break and pass. The Premier League side bossed the early exchanges amid heavy rain inside the San Siro cauldron and had an early shout for a penalty turned down when the fit-again Rafael van der Vaart's effort appeared to strike Alessandro Nesta on the arm. Crouch and Lennon caused seven-times winners Milan all sorts of problems and the Serie A leaders lost goalkeeper Christian Abbiati after 18 minutes with a head injury. 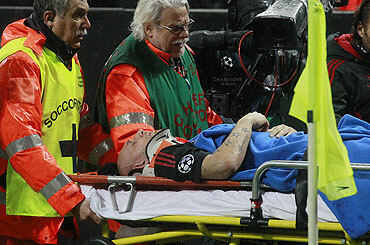 He could miss the second leg in London on March 9. Abbiati went to hospital for checks on concussion and his replacement Marco Amelia had to touch a fierce Van der Vaart shot over the bar after Zlatan Ibrahimovic had fired a freekick wide in Milan's first meaningful chance. Milan boss Massimiliano Allegri, with several midfielders such as Andrea Pirlo injured and the likes of Antonio Cassano ineligible, sent out a defensive-looking team with centre back Thiago Silva in midfield and in the first half it showed. He threw on Brazil forward Alexandre Pato at the break but Spurs again came the closest early on in the second half with Van der Vaart's superb chip drifting wide although Milan's Mario Yepes then had two headers well-saved by Heurelho Gomes. The hosts then grew hugely in confidence as the game became spicy with Milan's Mathieu Flamini and Gennaro Gattuso, who will miss the second leg after a booking, living up to their combative images before Crouch struck with a crisp finish. Milan thought they had equalised late in stoppage time but Ibrahimovic's spectacular overhead strike was ruled out for a push. 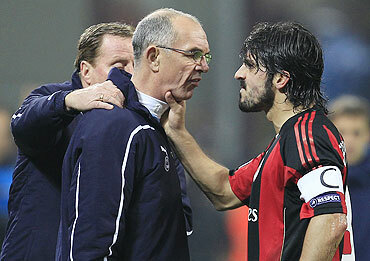 Gattuso was involved in a melee after the final whistle after confronting Spurs assistant coach Joe Jordan on the touchline. Raul celebrated his return to Spain with a goal to rescue a 1-1 draw for Schalke 04 in their Champions League last-16, first leg at Valencia on Tuesday. The 33-year-old former Real Madrid striker extended his record tally in European club competitions to 69 when he netted just after the hour to cancel out a 17th-minute effort from another ex-Real player, Roberto Soldado. "The team is prepared for the return leg," Valencia forward Soldado told Spanish television. "We have our weapons and we hope to use them in Germany. "We are among the 16 best teams in Europe and we want to be among the best eight. I hope my goal helps us make it into the next round." Valencia controlled play for long periods but squandered a number of chances and will be disappointed not to have converted their superiority into an advantage for next month's second leg in Gelsenkirchen. Schalke's Lukas Schmitz was sent off for a second caution deep into stoppage time. Raul and Soldado were two of four former Real players on the Mestalla pitch, with striker Klaas-Jan Huntelaar and defender Christoph Metzelder also featuring for Schalke. After a cautious start from both teams, Huntelaar fluffed a chance to put the visitors ahead when he failed to connect with an attempted close-range volley in the ninth minute. 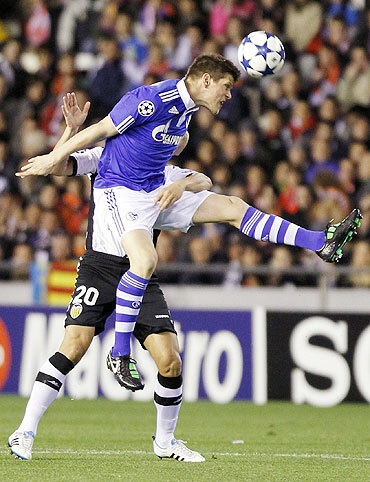 It was Metzelder's mistake that led to Valencia taking the lead when he lost possession and Jeremy Mathieu crossed for Soldado to clip the ball past keeper Manuel Neuer from six metres. Raul then showed his experience to find space inside the penalty area and send a low left-foot shot across keeper Vicente Guaita into the far corner of the net.